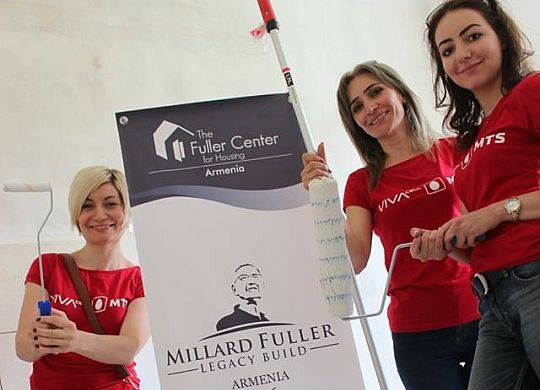 The 2016 Millard Fuller Legacy Build is a two-parter — with the first week an international blitz in Armenia last week where volunteers worked alongside 12 families to help them move from living in metal containers (known as “domiks”) to simple, decent homes. The second part of the 2016 Legacy Build will be in the United States as volunteers converge on Valley, Alabama, Sept. 18-23. Click here to learn more or to register. In the short video below, Fuller Center President David Snell and Director of International Field Operations Ryan Iafigliola talk about their experience last week in Armenia. Afterward, be sure to scroll further and check out the gallery of photos from the build, as well as related links. Armenian newspaper Aravot reports on how 12 families lives have been changed. Download photos from the build. Visit Fuller Center Armenia’s website.